Times they are a changing, and retail, like so many other industries, isn't exempt. However, it's a particularly uncertain time for independent shops. They are under pressure from customers constantly looking for deals and big retailers ever expanding their ranges. 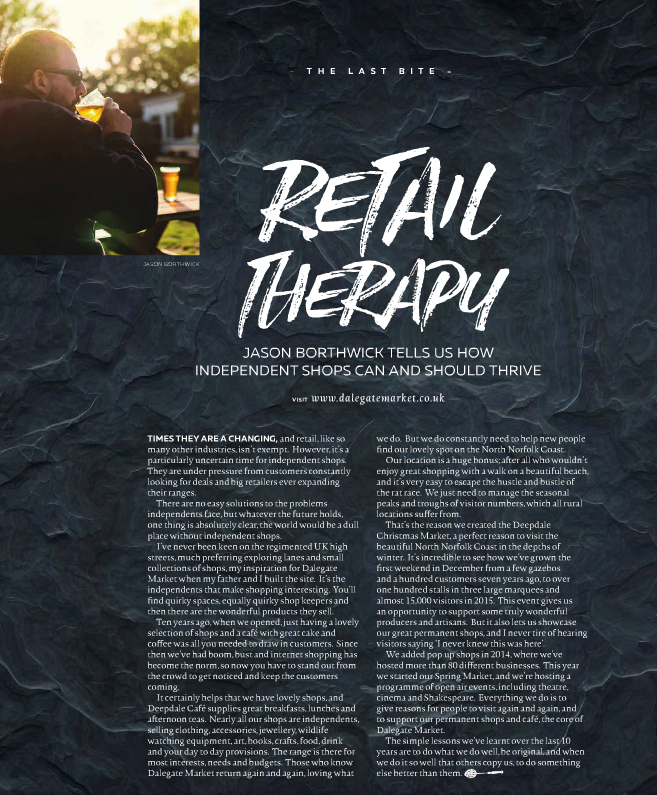 There are no easy solutions to the problems independents face, but whatever the future holds, one thing is absolutely clear, the world would be a dull place without independent shops. I've never been keen on the regimented UK high streets, much preferring exploring lanes and small collections of shops, my inspiration for Dalegate Market when my father and I built the site. It's the independents that make shopping interesting. You'll find quirky spaces, equally quirky shop keepers and then there are the wonderful products they sell. Ten years ago, when we opened, just having a lovely selection of shops and a cafe with great cake and coffee was all you needed to draw in customers. Since then we've had boom, bust and internet shopping has become the norm, so now you have to stand out from the crowd to get noticed and keep the customers coming. It certainly helps that we have lovely shops, and Deepdale Cafe supplies great breakfasts, lunches and afternoon teas. Nearly all our shops are independents, selling clothing, accessories, jewellery, wildlife watching equipment, art, books, crafts, food, drink and your day to day provisions. The range is there for most interests, needs and budgets. Those who know Dalegate Market return again and again, loving what we do. But we do constantly need to help new people find our lovely spot on the North Norfolk Coast. Our location is a huge bonus; after all who wouldn't enjoy great shopping with a walk on a beautiful beach, and it's very easy to escape the hustle and bus tie of the rat race. We just need to manage the seasonal peaks and troughs of visitor numbers, which all rural locations suffer from. That's the reason we created the Deepdale Christmas Market, a perfect reason to visit the beautiful North Norfolk Coast in the depths of winter. It's incredible to see how we've grown the first weekend in December from a few gazebos and a hundred customers seven years ago, to over one hundred stalls in three large marquees and almost 15,000 visitors in 2015. This event gives us an opportunity to support some truly wonderful producers and artisans. But it also lets us showcase our great permanent shops, and I never tire of hearing visitors saying 'I never knew this was here'. We added pop up shops in 2014, where we've hosted more than 80 different businesses. This year we started our Spring Market, and we're hosting a programme of open air events, including theatre, cinema and Shakespeare. Every thing we do is to give reasons for people to visit again and again, and to support our permanent shops and cafe, the core of Dalegate Market. The simple lessons we've learnt over the last 10 years are to do what we do well, be original, and when we do it so well that others copy us, to do something else better than them.